Sometimes it is all you can do to keep your head above water. When this happens, I know to take a long walk in the woods. Or, since moving to the country, hang around home and clear brush and fallen branches. And then there’s another tactic: get away. Even if where you live is off the coast of Northern Washington, over the border with Canada in the outer reaches of an archipelago of islands in the Salish Sea, one may still feel the need to get away. So my friend and I volunteered to count swans on Shaw Island last weekend for the Washington Department of Fish and Game, under the umbrella of Preservation Trust. Shaw is but a short ferry ride from San Juan Island, but in its way, worlds away. You have to remember that an island is always a place apart. My friend and her husband have been living in a trailer on site while building a custom home. This makes our remodel look like a walk in the park—although we did live on a boat for a few months. Boat, trailer, much the same. Small. On a moored boat one may have to fend off otter. Into a trailer, mice will creep. And as much as she hates to do it, my friend sets mouse traps. When she catches one she puts on gloves, picks it up by its tail, walks down to the edge of Egg Lake and places the little mouse on a stump over the water. An offering to the eagles. We live on a land of waters, and where there is water there will be birds. Salt water birds stay all winter, like us. And like us, they are easier to track. But on this morning we were looking to report on the migratory pattern of swan upon Shaw Island. Dressed in outdoor gear, bearing binoculars, notebook and pen, we left in the dark to catch the first morning ferry. The irony was that at sunrise my friend’s lake, Egg Lake, would be full of swan. 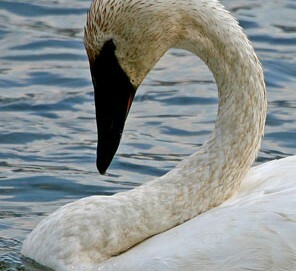 Trumpeter swan. But others would be responsible for the count on San Juan Island that morning. We were off to Shaw Island. Our jeep drove down every open road on island—all 7.7 sq. m.–through heavily wooded forests searching for ponds, coves, inlets, anywhere swan might be found. Light green lichen dangled from branches like chandeliers. Out my side window I became mesmerized with the pattern of fences. Split-rail fences in every state of standing and collapsing, covered in emerald green moss. We stopped in all the public places on Shaw—all three—to inquire. The grocery store was closed. A librarian opened the library for us. The postmaster inquired of his customers, and no, no one had seen swan on island for perhaps a year. With no swan to report to the Department of Fish and Game and a couple hours before the next ferry, we turned our jeep into Our Lady of the Rock, a Benedictine Monastery for women. Here traditional habit-dressed, Gregorian-chanting cloistered nuns are “living out the liturgy through prayer, praise and contemplation” upon 300 acres of forest and farmland. We didn’t see any nuns either. I’ll be back, perhaps as a guest. I really liked this post, Kim! I don’t have time to say anything more deep and profound than that right now, but I just wanted to share that I enjoyed the story and the poignancy of the fact that you had this special/unique experience of going around to count swans, and even though you didn’t find any swans (or nuns! ), it was still a valuable and memorable experience that we all got to live a little bit with you. Thank you! Wonderful to hear from you, Shira. You can imagine how much I love living here, as you know the islands. Interesting, isn’t it, how our lives are always intersecting? Please come visit us on SJI. Would love to meet your children! I am fond of your blogs too at http://anapperscompanion.com and I share your love of Thomas Merton. I start every day with “A Year with Thomas Merton: Daily Meditations from His Journals.” And when the year has ended, I start the same book again.